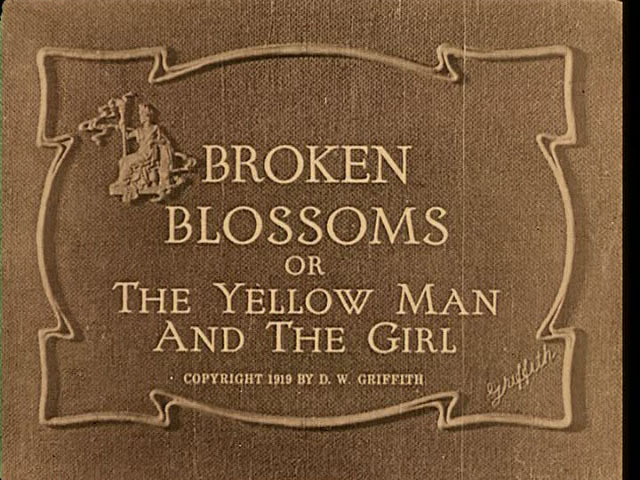 Entitled Broken Blossoms: The Yellow Man and The Girl, the film is an impassioned tragedy and a masterpiece of the silent era. It stands in contrast to Griffith’s other massive epics, such as The Birth of a Nation (1915) or Intolerance (1916). Broken Blossoms is a gentler and more sensitive film. The story was adopted from Thomas Burke’s short story entitled “The Chink and the Child” taken from his book, Limehouse Nights. It was filmed almost entirely on two small indoor sets to capture the delicate and intimate nature of the film, as instructed by Henrick Sartov, the cinematographer. In total, it was shot in less than three weeks, but despite its quick filming schedule the film was a box office success. It was distributed by United Artists. The film stars Lillian Gish (as Lucy, or the Girl), Richard Barthelmess (The Yellow Man) who played the character in “yellow face,” and Donald Crisp (Battling Burrows) who also played General Ulysses S. Grant in The Birth of a Nation and worked as an assistant to D.W. Griffith for many years before becoming a film director on his own. “It is a tale of temple bells, sounding at sunset before the image of Buddha; it is a tale of love and lovers; it is a tale of tears. It begins in a port town in China where a young Chinese man (The Yellow Man) is contemplating a journey while receiving advice from a Buddhist priest. He witnesses several Western sailors fighting outside and decides he will go to England to be a Buddhist missionary, to “take a glorious message of peace to the barbarous Anglo-Saxons, sons of turmoil and strife.” There are two scenes of a Buddhist monk ringing a bell. He boards a ship for the Limehouse district of London, a foggy slum of the city. He lives there for years working at the Cheng Huan shop selling Chinese trinkets. He spends his years smoking opium at the “scarlet house of sin” after becoming disillusioned with his idealistic cause. The next title reads: “In this scarlet house of sin, does he ever hear the temple bells? There are no more scenes of the bell ringing. We meet the illegitimate daughter of Battling Burrows, Lucy, who is badly beaten after Battling Burrows’s manager gets angry at him for drinking. She receives advice from a group of some ‘women of the street’ who tell her not to get married but to sell her body. After her father beats her she pitifully moves her fingers over her mouth to force a smile, as he requests. Later, the Yellow Man meets two men, Anglican clergymen, and one is preparing to travel to China to “Convert the heathen” and they hand the Yellow Man a book entitled “Hell.” Lucy goes out shopping and the Yellow Man spots her and notes her beauty. She is also followed by a man called “Evil Eye”. She tries to purchase a single flower in exchange for some tin foil from a shop keeper, but she is denied. She grows concerned as she is cornered by Evil Eye, but the Yellow Man rescues her. Lucy returns home but her angry father beats her again until she passes out. When she awakens, she wanders down to the dock and collapses on the floor of the Yellow Man’s shop. He carries her upstairs and lavishly takes care of her and allows her to sleep (this extended scene lasts for a bulk of the film). Meanwhile, Burrows is fighting in the ring. One of his associates at the ring goes to the Yellow Man’s shop and the Yellow Man must leave to pick up his request, but the associate overhears something break upstairs, a jar of flowers dropped by Lucy. So he quietly goes upstairs as the Spying One, and spots her. Laughing, he leaves to go tell Battling Burrows. Burrows comes to the shop and ruins the whole room in a fury while the Yellow Man is out picking up flowers for Lucy. They return home and he begins to beat her but she escapes into the closet for the famous scene, which even stunned Griffith during the filming. The Yellow Man races to her house but he is too late as Burrows has axed his way into the closet and beats her to death. The Yellow Man finds her dead on the bed and Burrows emerges as they stare each other down until Burrows tries to grab his axe but The Yellow Man shoots him several times and takes the body of Lucy back to his room in his shop. In Burk’s short story, Cheng Huan (The Yellow Man) puts a poisonous snake in Burrows bed to kill him. The film closes as the Yellow Man lights a candle and says a Buddhist prayer before a small alter. He rings a small bell once, says goodbye to his White Blossom, and then dramatically stabs himself beside the dead Lucy just before the police show up to arrest him. Two scenes of the Buddhist bell ringing and the ship entering the harbor are shown, just as in the beginning. Lillian Gish later claimed the theatres that premiered the film in New York were all decorated with ornate draperies, flowers, moon lanterns, and beautiful Chinese artwork. However, on a darker note, the scenes of child abuse in the film disgusted many critics, including Griffith, during the filming, and drew many away from the film. It was released during a period of great skepticism against Chinese immigrants, known as the “Yellow Peril” and has since been criticized for its portrayal of Asians. Broken Blossoms is charming in its innocence and simplicity, and it is also meticulously well crafted in both its writing and acting. Broken Blossoms is by far my favorite D.W. Griffith film and comes highly recommended, though it is unfortunately often overlooked in favor of his much larger and more controversial films, The Birth of a Nation and Intolerance.